A Few Scraps: FMQ Weekly: Should you Stitch in the Ditch before you FMQ? FMQ Weekly: Should you Stitch in the Ditch before you FMQ? I had the good fortune of learning FMQ from probably the best possible teacher there was. Her name was Kathy Sandbach. She quilted professionally for other quilters, not on a long arm, but on her domestic machine. Can you imagine? 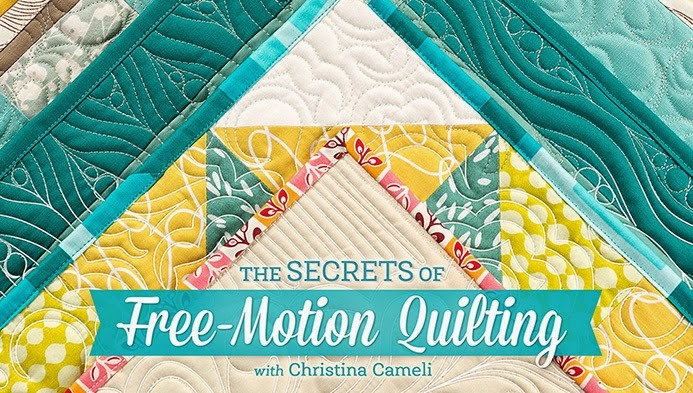 She also wrote books for C&T Publishing and I can't tell you how many times I checked out "Show Me How to Machine Quilt" from the library because I was in nursing school and had no money and wanted to remember what Kathy taught me. Anyway, I'm telling you this because as a person whose business depended on doing good and fast quilting on her domestic machine, Kathy had developed a very practical and sound approach to free-motion quilting. When she taught us, she showed us how to baste and then jump right in freehand, without even marking designs. Notably, she did not teach me to "stitch in the ditch" before doing the FMQ. Stitch in the ditch (SITD) is what you call quilting along the seams of patchwork, right against the seam, ("in the ditch"). Some quilting teachers teach their students they have to do this before they free-motion quilt. I am so happy I learned from Kathy. If I had learned from someone who told me I had to quilt my quilt twice (once SITD and then again with FMQ) I would never have started free-motion quilting. I would have two unfinished quilts still in my closet probably. I didn't have time for that. In fact, I still don't have time for that. Who has time for that? 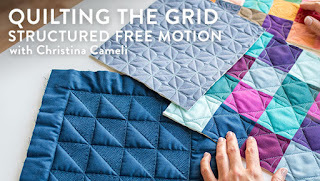 Someone asked in my Craftsy class about whether they need to SITD before they FMQ and I typed up such a long reply I thought it was basically a blog post, so I wanted to share it here too, because I while I bet some of you have never even heard of this "Stitch in the ditch before free-motion quilting" idea, some others of you think it absolutely has to be done, all the time, for "every stinking seam". So let me share my thoughts on this. Stitch in the ditch (SITD) is an option, not a requirement. It has two effects. One is to stabilize your quilt so you have less shifting around as you quilt. That's certainly something we want, because it means our quilt isn't distorted and puckers are prevented. But, stabilizing the quilt is really the function of basting, which we are already doing anyway, so there's no reason we need SITD for stabilizing the quilt. The second function of stitching in the ditch is to hold down seam lines so they don't puff upwards when the quilt is quilted. You're most likely to see this with dense, shape-filling quilting. Since anything that's not quilted pops up a bit and the things that are quilted push back, the unquilted seam lines will pop forward a bit if you are quilting each shape in a block individually. Here is a block I quilted without stitching in the ditch. Can you see the seam lines popping forward a bit? If this would drive you crazy you should maybe stitch in the ditch. If you can't see what I'm talking about, or if you're thinking "the quilt is going to be more rumply than that after I wash it!" then there is no problem and you should probably not stitch in the ditch. If you can kind of see what I'm talking about and don't love it, but would prefer not to stitch in the ditch, you might consider all-over quilting designs instead of shape-filling designs. Here is the same quilt block quilted with an all over pattern. Again, I didn't stitch in the ditch, but now you don't see the goofy seam thing happening. Cool, right? Now, if you are sending your quilt to hang in a quilt show where you might win money or fame or free burgers or something, SITD may make the difference between getting a ribbon and not getting a ribbon. People spend so many hours quilting for show that a few extra hours stitching in the ditch may not be a big investment compared to the dismay it may save them. 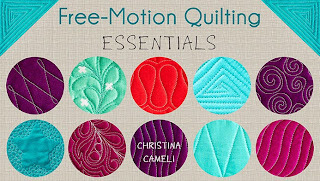 I find that it's almost always quilters who quilt for show that recommend SITD before free-motion quilting. I don't quilt for show. And every shred of time I get quilting is a hard won triumph after tending to the needs of my family, my job and my household. I really don't like to waste that time on unnecessary tasks. Also, I use a lot of all over designs, and I know my quilts are going to be washed, which is going to give them plenty of bumpiness anyway, and at that point a little puffiness at a seam line will be darn near unnoticeable So it's the right choice for me to just dive into the FMQ. And I've been happy with the results. Based on your plans for your quilt and your quilting you can decide what you'd like to do. You could make a trial block and quilt it with your chosen batting and quilting design to help you determine if SITD is worthwhile for that particular quilt or not. If SITD makes you feel safer and more confident with your FMQ, then go for it, I definitely support whatever makes you feel ready and excited to quilt. If you prefer the way SITD looks and you want to do it you should! 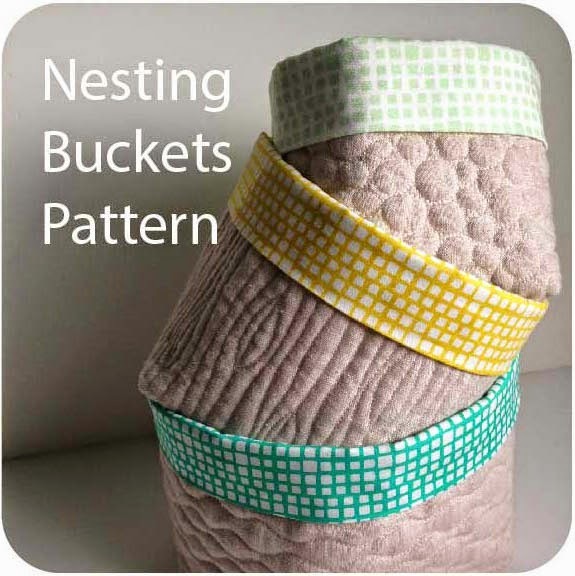 I hope that was helpful to some of you quilters out there. I like to take the voodoo out of free-motion quilting so you feel good about what you're doing and why you're doing it. Happy stitching! Great blog Christina. I have Kathy's book and I now have your new Craftsy class to go with your first. Great post! Sometimes I SITD, sometimes I don't depending on the look I'm after. But I have never SITD a whole quilt. I quilt on my domestic machine. I hadn't heard of this rule either, and if I had, I would have broken it. :D Sometimes I SITD, sometimes I don't. It depends on the quilt I'm doing (on my domestic, as well). Great post. I quilt on my DSM and I do SITD on large quilts and I do it with my free motion foot. My goal is to stabilize the centre of the quilt so that I can quilt the border and bind it. This gets rid of the bulk around the outside edge and that makes quilting the middle much easier. I do like the idea of all over quilting as shown in your second example and that would certainly like to give it a try! Love your post and your attitude towards FMQ! When I learned how, I felt I had been set free and quilting became a joy- as I had trouble with sewing straight lines! I have your new book and absolutely love it. Thanks for sharing your talent and creativity with the quilting community! What a great post! Based on your sample, I now know that I should SITD on a quilt that I'm now quilting, because I'm doing each block separately. But there are many other times where I'm wasting my time. Thanks so much! I took a class from Kathy Sandbach about ten years ago. I remember her telling us that she needed to stabilize the three layers by first quilting a few vertical lines and then a few horizontal lines before doing any FMQ. This was in addition to whatever method we had used to hold the three layers together. Are you saying that these additional straight lines are unnecessary now? I have been quilting a log time and I know that methods change as our tools improve, etc. I would appreciate a response as I admire your quilting and know you would be answering as someone who has quilted countless quilts. I do hope to take a workshop with you when you're in my area. Thank you! Ain't nobody got time for that!!! Thanks for explaining this for us Christina. It basically boils down to preference. Great post...remember being very puzzled about this when I started FMQ. I absolutely dislike SID and once I discovered that I don't need it for an allover design felt that I had been set free. What a time saver! 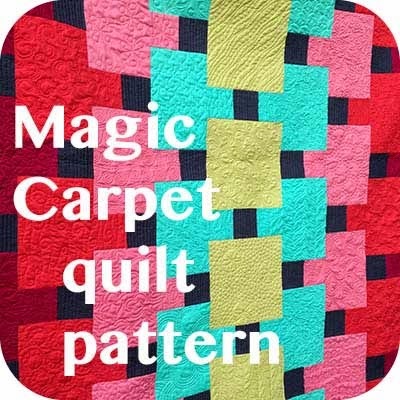 I probably only use it now when I FMQ individual designs in specific blocks. good points here. sometimes I do and sometimes I don't SITD. it all depends on what the design is. thanks for showing us the examples. Great post! I just started taking your new Craftsy class today and so enjoy your teaching style! I have taken FMQ classes from both camps. I don't SITD before I FMQ or I just wouldn't bother with the FMQ. And for me all the joy would be gone. I also never plan to put a quilt in a show to be judged. I have plenty of self doubt without it. Hi Aunt TC! Interesting, I don't remember her telling us that but maybe I've forgotten the details. Well, in my experience, no, you don't need that step. If it makes you feel safer it won't hurt but if you prefer not to have those lines, because of time or artistic preference, then you should feel free to do away with them. As always you have put a lot of thought into this post. Sometimes I STID & sometimes I don't. I never heard of doing it prior to FMQ but with your examples I can see why it would be unnecessary in many cases. Thank you for the visuals. Thank you thank you! Great post!! Great Advice Christina! I don't quilt for show either (as if) but i would consider quilting for Free Burgers, LOL. Wow! Thank you for this post. I've been waiting for someone, an experienced FM Quilter, to explain this. Hopefully I'll get over my "phobia" of FMQ and get some of my tops done. Thanks again! 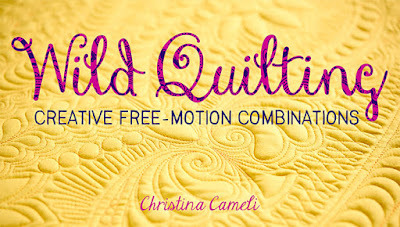 I do all my free motion quilting on my home machine for the last 15+ years and have never SITD before I FMQ. I have never had a problem with the seams puffing up either. I can see where SITD could be helpful to some people, but wouldn't want the SITD stitching lines interfering with the look of the quilting on the back of the quilt. I just listened to your podcast with Pat Sloan and wanted to let you know that I have been following you on Bloglovin for a while. I originally learned to FMQ from a blogger in Nebraska who I had been following and she gave me some pointers and encouragement. Since then, I have gotten some FMQ books and since I retired I quilt all my own quilts on my Janome 6600 and have quilted several king size ones. I don't have your books, but I get ideas from your blog, pinterest, other blogs, etc. When I'm trying to decide what to quilt, I go back to see what I have saved on pinterest, or what FMQ teachers have posted. I have never taken a class on FMQ, but now feel pretty confident. One of my quilts won a 3rd place ribbon in the Dallas Quilt Show (TX), which is a pretty big show, so I was very excited about that. I'm so grateful to all those who are willing to share their ideas and expertise which has given me the encouragement to go ahead and do it. I love being able to say that I made the "whole" quilt myself. BTW, when I made a kind of rustic table cover for our patio table, I followed your idea of quilting each block (36 8" squares) with a different quilt design. Also, I agree with you about SITD. Sometimes I do it, but for an all over quilting, I don't. Keep up the good work and thanks! Great post! Yay for Kathy Sandbach. She taught ME so much...I studied the quilt I just washed after it came off our bed (so much fun to switch them around, no?! That's why we need, like ... LOTS) and I thought whoa, I was sure doing some awesome FMQ there on my lovely Bernina...back in 2003! 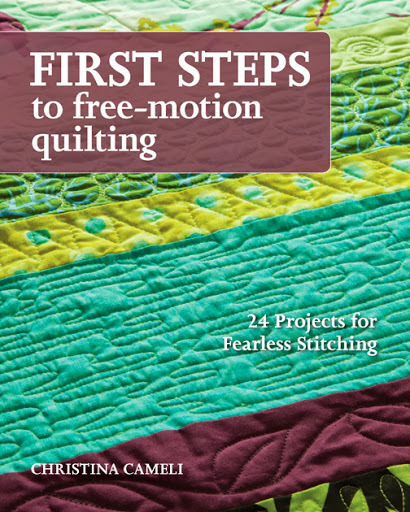 And I realized it was Kathy Sandbach's two books (her first is the best I think) and seeing her on Alex Anderson's Simply Quilts that changed my quilting life. That and finding out about spray basting! Thanks for all the encouragement you do!! What a timely post. I am slogging through the SITD portion of a quilt right now and not loving it. For this quilt it is necessary since it is going to be the only quilting on part of it, but it still is no fun. Maybe I should have omitted the SITD and done some FMQ instead. I agree with everything you say in your post. Also, to be honest, I like the puffy look! It will be washed and loved and no one will notice it as the quilt will already be puffy all over. thanks so much for this ! there are a couple of craftsy teachers who say you need to SITD - I'm with you though, life's too short !!! Thanks, Christina! Very helpful indeed. Great blog post Christina! When I first learned to free motion quilt.....years ago....I am so glad no one told me I had to stitch in the ditch first. I rarely do that type of quilting. Hi Sue, I like to start in the middle so I get the hardest part done first, but I think you can do quadrants just as well. The only thing you want to avoid is quilting all around an area and leaving the unquilted center for last. Happy stitching! I love your practical approach Christina! I've been playing with ideas that anchor the ditch (like covering it with a wiggly line) but aren't IN the ditch, which is so time consuming and frustrating. I generally like to "ditch n' fill" which means to ditch the area I'm quilting into like an outline, then fill the space completely, then move to the next space. It's a bit less frustrating and time consuming because you don't have to quilt the whole quilt only to go back to quilt it again.